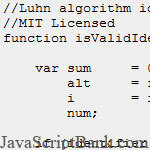 This solution can be done through Luhn algorithm (developed by Hans Peter Luhn) based on the original features of a credit card number. Please read the full post for the details of this solution. Credit cards on the web sites have become just about as ubiquitous as sign-in forms. One of my favorite moments in computer science was learning the algorithm for determining a valid credit card number. The process doesn't involve making a call to a server or checking accompanying information, just a basic algorithm that uses a check digit to determine if the credit card number is in the correct format. Issuer Identification Number (IIN) - an identifier indicating the institution that issued the number. The first digit indicates the type of institution issuing the number (for instance, banks are either 4 or 5, so all credit card numbers begin with one of these). The IIN contains six digits. Account Number - an identifier between 6 and 12 numbers long, inclusive. Check Digit - a single digit to validate the sum of the identifier. Identifiers of this format can be between 13 and 19 digits long and used for any number of purposes, though most people deal strictly with credit card numbers. Hans Peter Luhn, a scientist at IBM, developed Luhn algorithm to protect against unintentional mistakes in numeric identifiers (it is not a secure algorithm). This algorithm is the basis for magnetic strip identification cards, such as credit cards, as defined in ISO/IEC 7812. Yes, I did test this on my own credit card numbers as a test. No you can't have those sample files.